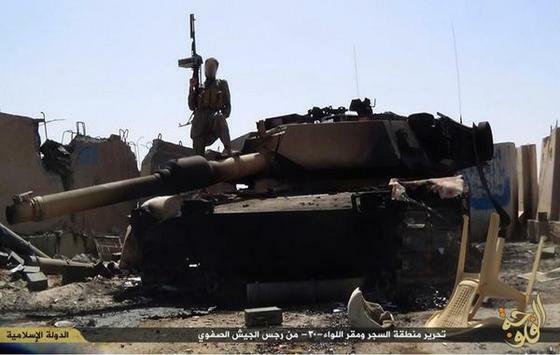 An Islamic State fighter stands on top of a US-made M1 Abrams tank. 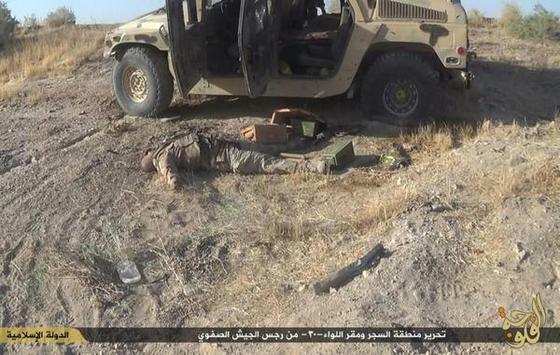 The Islamic State released photographs of last week’s rout of an Iraqi Army unit in the Saqwaliya area north of Fallujah in Anbar province. More than 300 Iraqi troops are reported to have been killed in the attack. The pictures from the assault on Camp Saqwaliya were released on Twitter by fighters and supporters of the Islamic State. 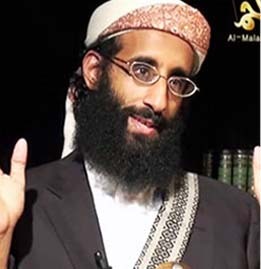 Recently the Islamic State has begun to release its propaganda on Twitter via its supporters. Twitter has taken an active role in suspending official accounts associated to the Islamic State’s wiliyats, or administrative districts. 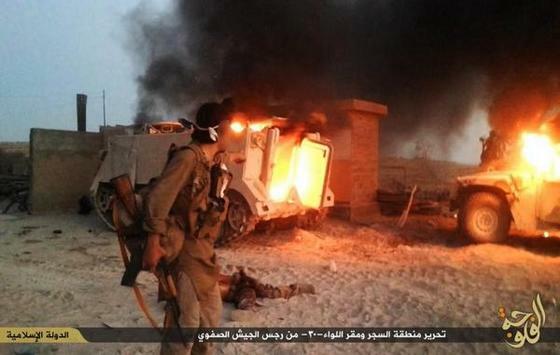 While the authenticity of the photographs cannot be confirmed, the captions bear the title of Wilayat Fallujah. 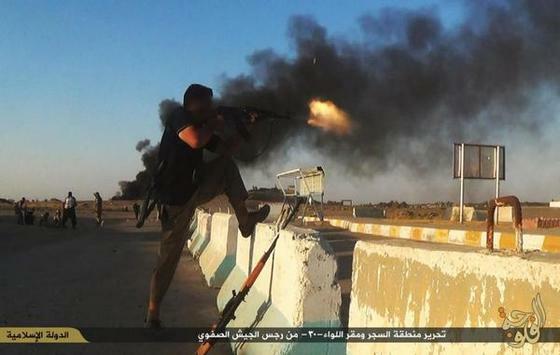 In the past, photographs released using this method by the Islamic State have proven to be authentic. The photographs show numerous Iraqi Army soldiers who were killed in the fighting (these photographs have not been included below as they are extremely graphic). 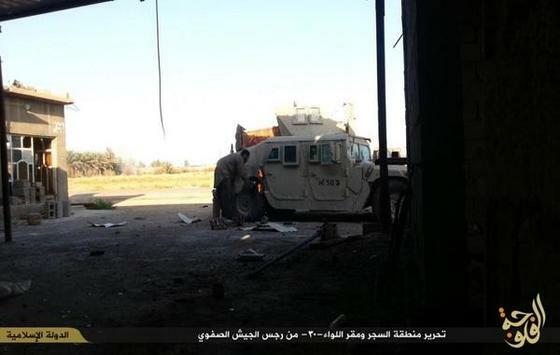 Based on the photographs, the Islamic State seized or destroyed at least one M1 Abrams tank, four M113 armored personnel carriers, 15 Iraqi Army Humvees, a BMP infantry fighting vehicle, and other trucks. 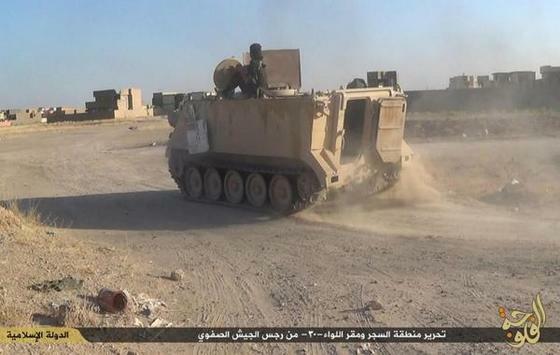 At least three of the US-donated M113s appear to be operational; an Islamic State fighter is shown driving one M113. The M1 tank appears to have caught fire. 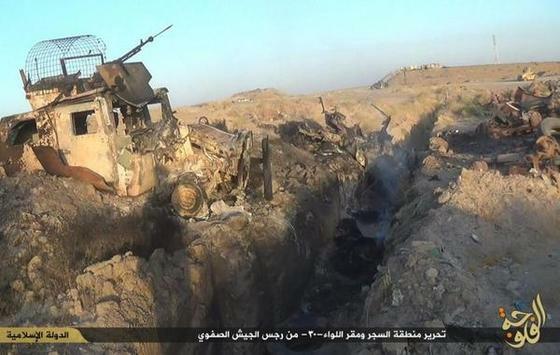 According to the Islamic State, the Iraqi unit that was overrun was from the 30th Brigade. The 30th Brigade is subordinate to the 8th Mechanized Division, which is based south of Baghdad. The Iraqi Army has been forced to deploy units from other provinces, as much of the Anbar-based 1st and 7th Divisions have been rendered combat ineffective. The Islamic State has maintained the initiative against the Iraqi military in Anbar province more than seven weeks after the US began launching airstrikes against the jihadist group inside Iraq on Aug. 7. 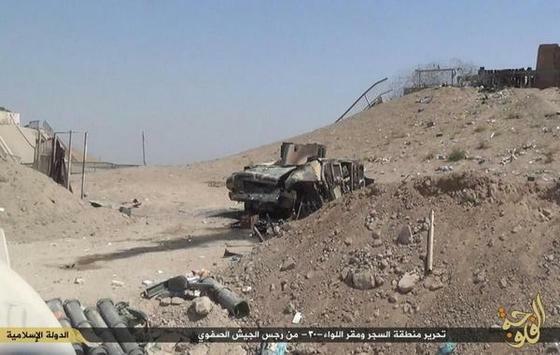 It seems like the constant loss of armored vehicles, singularly or in column ambushes, is absolutely melting the Iraqi armed forces. It leads to attrition, and the collapse of entire units. Combine that with the constant seizures of small/medium sized military posts that dot certain areas, and you can see why the Iraqi armed forces are not only losing ground, but crumbling away as well. The Iraqi armed forces take a lot of human and material losses in these attacks. I’m talking about the battlefield and logistical paradigms, obviously there also politician and sectarian factors that play a part in all this as well. What did US military members feel like in 1974-75 watching as the ARVN collapsed in the face of the NVA? I think I know. There’s something very wrong here. If this Iraqi Army cannot resupply,reinforce and defend it’s bases with the assurance of US air-cover then how’s it going to retake Mosul ,Tikrit and Fallujah?? There’s no safety in numbers with this inept force. Trim it down to those actually willing to fight and die for their country. Then again you risk turning those demobilised over to ISIS. There needs to be a limited foreign troop presence to bolster anybody willing to fight ISIS. 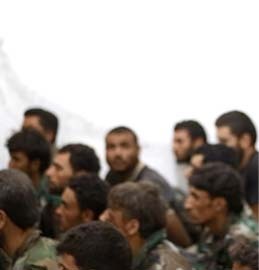 When I say anybody I mean both militia and regular forces , Sunni , Shia and Kurd. 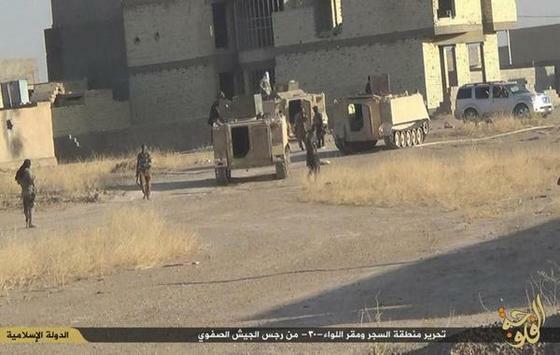 This Iraqi Army is looking more and more like the ARVN of 1972-1975. It’s very suspicious that the majority of troops pulled out before the assault. Seems like somebody in the chain of command sold out again. Look at the sheer loss of expensive equipment. Hopefully these gains will show those on Capitol Hill that ground troops are needed to eradicate ISIS. Do it now , before ISIS starts looting even more weapons from the resupply caches that the US and Allies plan to send to the Iraqi Army. Until the corruption is purged from the command structures of the Iraqi Army there’s no trusting a single unit to stand and fight no matter how well equipped. The Generals that remain in charge must be those willing to die for their country. They need to be real soldiers that can command effectively , not political appointments. We are really staring down a black hole here , we risk sending billions of dollars more in equipment to a demoralised Iraqi Army , that abandons and retreats instead of standing and fighting. When I said “politician” factors, I was talking about Maliki and other corrupt officials in the Iraqi government. Just pointing that out since the sentence seems a bit off, and I should have used the word “political” instead. A major scandal has erupted in Baghdad. On September 19, 2014 the Iraqi air force dropped the critical supplies onto ISIS territory! This is why the Iraqi top brass didn’t believe field reports trickling in via the news media about the base running entirely out of supplies — especially water. Now the various officers responsible are finger pointing. The obvious Iraqi error was a failure to have a forward air observer, with marking rounds, and positive communications down to the intended drop zone. At aircraft speeds, everything on the ground passes by in a blur. All of which is to say that ANY Iraqi army outpost is subject to siege warfare techniques. Even a few days puts any garrison into dire thirst. That promptly causes a TOTAL breakdown in morale. 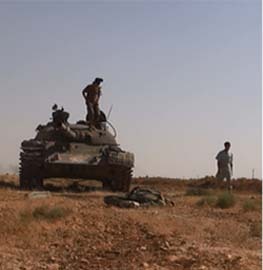 It’s the repeated failure to keep the troops supplied that causing the Iraqi army to evaporate. 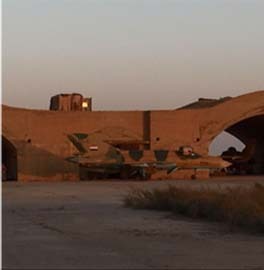 I’ve yet to see an Arab military base (Syrian or Iraqi) that looks properly laid out. In the Iraqi case, it’s as if they learned absolutely nothing from the American Army. They must have skipped class that day. Their errors fill Army field manuals: what not to do. One can only hope that such basic matters are being addressed at this time. At the top of the list is having enough water on hand, at all times, to prevent crisis. Everything to date points to an army that acts (provisions) like it’s peacetime. The Iraqi Army is no more than a bunch of rag tag Shiite political loyalist rejected by the US military brass as unfit for their positions but still installed by Maliki to prevent a Sunni uprise. Maliki swore he would work to build a Sunni/Shiite government but of course all Arabs are liars. This is a anit-Maliki uprise more than anything. I want to buttress my remarks on supplies. There are many accounts from IA troops that portray an army that can’t get ammo up, water up, to front line troops — even when there is open road back to Baghdad and the attack is the national priority: Tikrit. The real reason that the IA could never advance was that even front line infantry was short of ammo before the battle even began. When ISIS counter-attacked — it was against troops that had just expended virtually ALL of their small arms ammo. (!) THIS is why morale keeps breaking down. 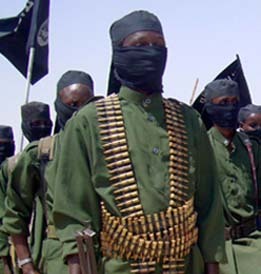 The general public is never informed that the leadership of the IA is so inept that they think ammo just jumps into bandoliers. During the US Army era, — and in Afghanistan, — it was chronically noted that the Americans HAD to supply the IA small arms ammo. The IA had left their abundant ammo supplies back at the depot. Every Muslim fighter wants to be a trigger puller. No-one wants to haul up critically needed ammunition. No-one. Psychologically, Muslim armies are still in the Eight Century — edge weapons for everybody! You will also find Muslim armies always running out of motor fuels, water, food — all for the same reason. The primary reason why the IA is chronically caught back at base is that mobility requires LOTS of supplies. It’s all too much for their ‘command’ staffs. This task is wildly under-rated in civilian circles. We don’t have to head off into the boonies — and bring civilization with us — while the other guy tries to destroy our stuff. Staff work is a totally thankless drudge. So, no-one in a Third World army wants to do it. This factor also informs us that the Shi’ite faction has absolutely no chance of moving up country against the Sunnis. It’s all that they can do to stay supplied right where they are. 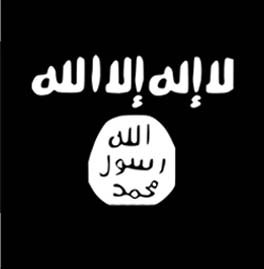 ISIS is winning Lawrence of Arabia style. One is well advised to pop in the DVD and watch that flick. The Turks play the role of the IA, of course. Fallujah is too close to Baghdad, north of which is consolidated by ISIS by this op. 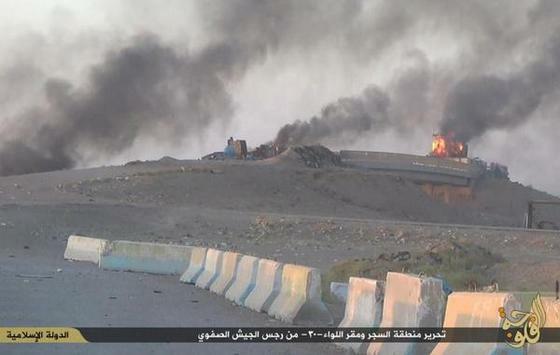 Burn the bridges in Fallujah by airstrikes, which are duplicate of Ramadi bridges. Even small dam there can be destroyed. This should be the first city to take back and widen the road that passes through middle of the city as much, for future use.